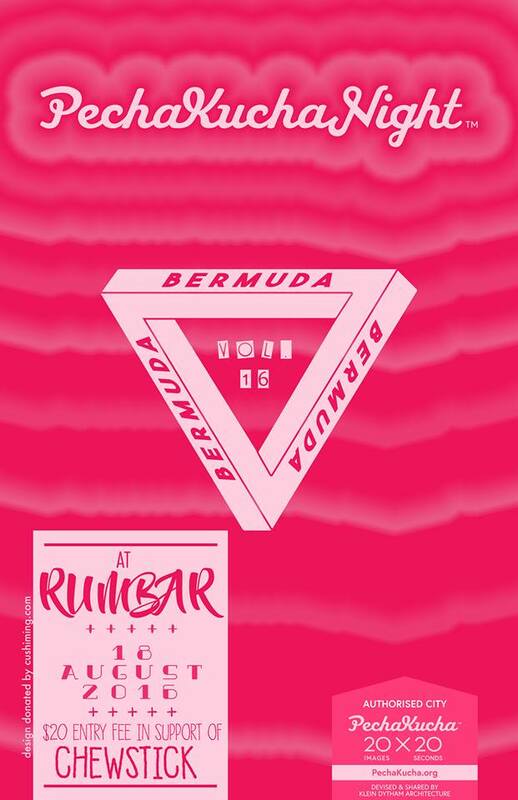 PechaKucha Bermuda is getting set to host its 16th edition tomorrow [Aug 18] at the Rumbar located below Victoria Grill on Victoria Street, with doors opening at 6.00pm and the event getting underway at 7.00pm. The event will serve as a fundraiser for The Chewstick Foundation, with a cover charge of $20 per person; children are free. “Therefore the presentation is only 6 minutes and 40 seconds in total. Since there is no pausing or going back, speakers have no choice but to keep to their allotted time. There will be eight different speakers who will speak on a subject they are passionate about. The presenters will include Jewel Landy [To Smile Or Not to Smile]; Luke Kesseram [Measuring the Height of the Global Economy]; Louis Gallipeau [Diversity in electronic music]; Lamar Dolcy [Parallels between Pedagogy and Personal Training]; Larry Mussenden [Bermuda CSI]; and Nana Turkson [Ghana – The Country, History & Culture]. Come at 6pm as seating is limited. The first presenter is scheduled to start at 7pm.